In an American backyard or event space, a barbecue grill is one of the most common cooking aids. While grilled foods are delicious, it's nice to treat your party guests to something else occasionally. If your guests love pizza, then they are sure to like a wood-fired pizza even more. Many homes and restaurants in Italy have outdoor brick ovens, which helps create some of the most flavorful pizzas on the planet. A mobile brick oven is all you need to bring a little taste of Italy to your next social gathering. Many people agree that the taste of a wood-fired pizza is superior to a standard oven-baked pizza. In addition to the delectable smoky taste that only a brick oven can produce, there are other unique flavor qualities that come from baking a pizza over a wood-fueled flame. The crust is just as important as the cheese and toppings to many people, and a brick oven is a great tool for a perfect crust. Since the heat is intense, it quickly seals the outside of the dough. The result is a crispy crust that's not soggy underneath but is soft and chewy on the inside. Additionally, the toppings are crispier and evenly cooked. One of the keys to making an excellent pizza is maintaining a consistent temperature in the oven. With a brick oven, the temperature stays consistent because of the continuous fire. Also, the temperature is hotter, which helps the pizza bake faster. A regular pizza usually only takes a few minutes to bake. If you're planning an event with a large number of people and want to provide plenty of pizza topping choices, a mobile brick oven will ensure that you can efficiently keep your guests satisfied. When ordering a large number of pizzas from a restaurant, you may have to wait up to an hour to have them delivered. If you run out of pizza at your party, you must either wait for a new order to be delivered or risk your guests going hungry. When you have a mobile brick oven at your event, you'll also impress your guests. Guests will be entertained by watching the chef prepare the freshly-made pizza over the fire, and some people may experience the unique taste of a wood-fired pizza for the first time. A mobile brick oven is great for any size of event if you want a catering option that is fun, easy, and delicious. If you are looking for event catering in Austin and want to treat your guests to fresh wood-fired pizzas, Mandola's is ready to serve. 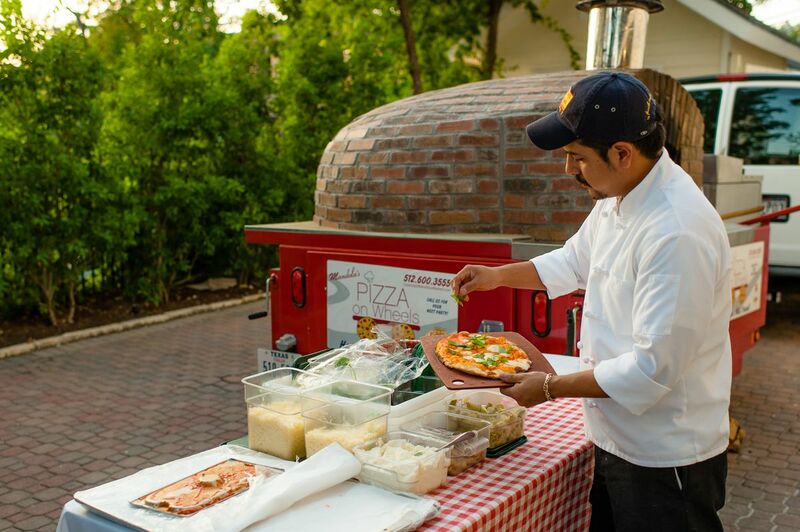 Mandola’s can bring a mobile brick oven to your event and will bake customized pizzas for you and your guests. Not only is Mandola's is a premier choice for Italian catering, but is also a must-stop location for Authentic Italian cuisine in Austin. Call us to reserve a mobile brick oven for your next party or event.